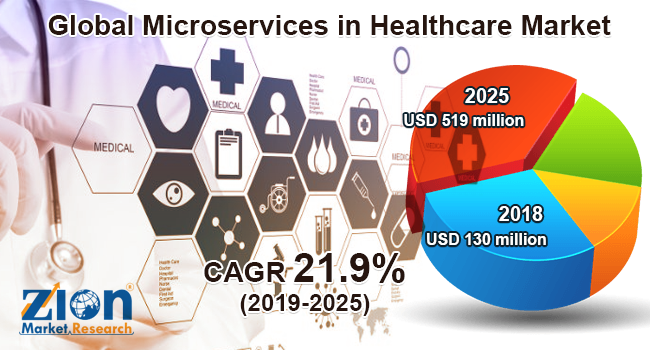 Global microservices in healthcare market expected to generate around USD 519 million by 2025, at a CAGR of around 21.9% between 2019 and 2025. Microservices (also called microservice architecture) is a process of developing innovative software systems that emphasize on structuring solo function modules with precise actions and interfaces. The report covers a forecast and an analysis of the microservices in healthcare market on a global and regional level. The study provides historical data for 2016, 2017, and 2018 along with a forecast from 2019 to 2025 based on revenue (USD Million). The study includes drivers and restraints of the microservices in healthcare market along with the impact they have on the demand over the forecast period. Additionally, the report includes the study of opportunities available in the microservices in healthcare market on a global and regional level. In order to give the users of this report a comprehensive view of the microservices in healthcare market, we have included a competitive landscape and an analysis of Porter’s Five Forces model for the market. The study encompasses a market attractiveness analysis, wherein all the segments are benchmarked based on their market size, growth rate, and general attractiveness. The report provides company market share analysis to give a broader overview of the key players in the market. In addition, the report also covers key strategic developments of the market including acquisitions & mergers, new product launch, agreements, partnerships, collaborations & joint ventures, research & development, and regional expansion of major participants involved in the microservices in healthcare market on a global and regional basis. The study provides a decisive view of the microservices in healthcare market by segmenting the market based on delivery model, component, end-user, and region. Based on delivery model, the microservices in healthcare market is segmented into cloud-based and on-premises. The cloud-based models are sub-segmented into the public cloud, private cloud, and hybrid cloud. The component segment includes services and platforms. Services are sub-segmented into integration services and consulting services. The end-user segment is segmented into healthcare payers, research organizations, healthcare providers, and life sciences industry. Some key players of the global microservices in healthcare market are CA Technologies, AWS, Microsoft, Pivotal Software, Inc., Salesforce, IBM, Oracle, NGINX Inc., Syntel, and Infosys, among others.